Gold ball bumping is primarily used to make interconnects for flip chip bonded die. This process involves placing a single bump (or stacked bumps) on each interconnect location on a die. Palomar Technologies’ standard process makes a bump where the top height is about 60% of the bump diameter. The bump shape could best be described as a flattened “Hershey Kiss”. This shape works very well for thermosonic flip chip attach processing. The smaller top diameter is about the diameter of the wire used and is much more easily deformed during the attach process than a flat “pancake” bump would be. This allows for looser top height variations than would be required for a flat bump. The 8000i Wire Bonder can best perform the bumping operation on entire wafers or diced sections of wafers. Though the work area is greater than 150mm x 300mm (6”x12”), it can handle 200mm (8”) wafers, or even 300mm (12”) wafers by rotating the wafer halfway through the operation. 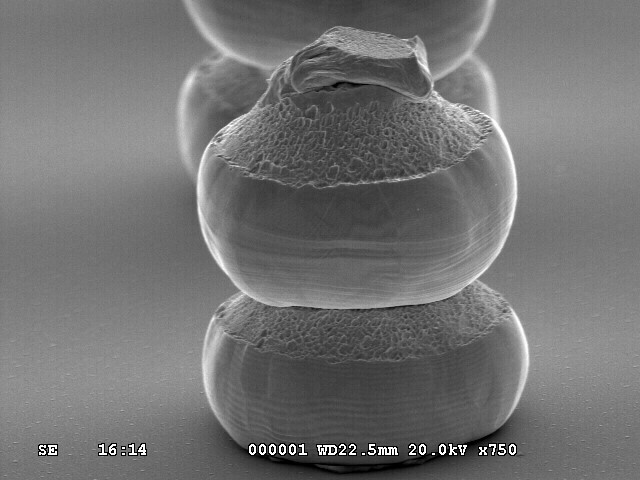 Single die can also be bumped if they are large enough to be held well with vacuum (roughly 6mm x 6mm or larger). Smaller die could be fixtured for bumping, but the time required to load and unload small individual die drives the cost up dramatically (10-20 times the cost per die on a wafer format). The 8000i can place bumps at a rate up to 12 bumps per second with a +/- 3 micron height and diameter variation. 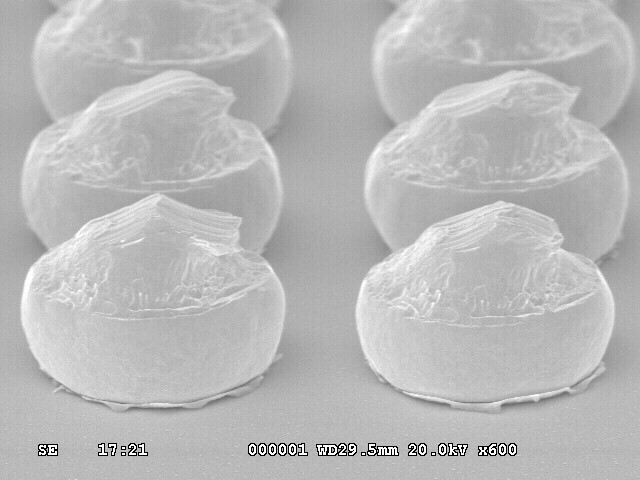 Bump sizes from 45 micron diameter (30 micron maximum top height) to 150 micron diameter (100 micron maximum top height) have been achieved in continuous production environments. Lower top height are also easily achieved (approximately 30% of bump diameter) for applications that require a thinner bump with a larger diameter. Stacked bump can also increase the height to diameter ratio (150-200% height to diameter has been achieved in production). Palomar Technologies Assembly Services can provide the bumping service for applications that require a single wafer to a few hundred wafers. This service can be quoted by submitting the bump requirements (bump height and diameter) as well as die/wafer information (number of bond pads per die, bond pad size and the wafer size and number of die per wafer. Contact Assembly Services to tell us about your organization's requirements.